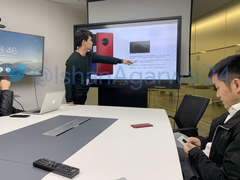 Famed leakster Ishan Agarwal shared a picture of an internal OnePlus meeting talking about a new phone prototype. This could be the 5G OnePlus phone that the company plans to launch in early 2019. The picture shows the device sporting a circular camera bump and presence of red and light grey variants. If news so far is true, this phone could launch as a distinct lineup with its own set of premium features and pricing. We've been hearing about OnePlus's plans of launching a 5G phone ever since co-founder Carl Pei revealed intentions of being one of the first OEMs to launch 5G smartphones next year. Last month, we reported about OnePlus mulling a distinct lineup of premium 5G phones apart from the regular successor to the OnePlus 6T. Now, it looks like we might have a sneak peak as to how that phone might actually look like. 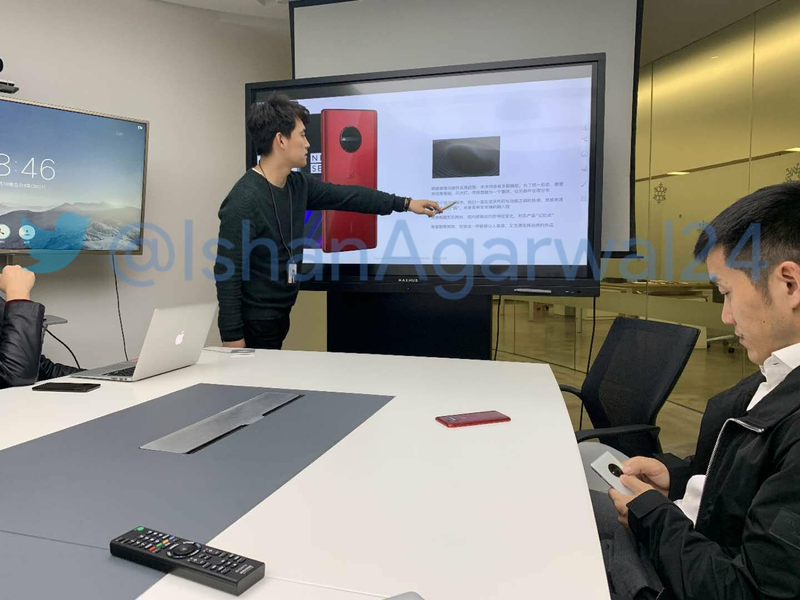 Famed leakster Ishan Agarwal shared a picture on Twitter taken during an internal OnePlus meeting, which shows the presenter discussing about a new phone model. Upon close examination, one finds that the back of the new OnePlus device sports a camera setup that is reminiscent of the Nokia Lumia 1020. The presentation shows a red variant of the device, which is probably the one lying face down on the table, and we also get to see CEO Pete Lau holding a light grey variant. It is evident that the device is in the prototype stage so the final design could be different. Given that OnePlus just launched the 6T, chances of the above device being a OnePlus 7 are less likely. Taking into account all that we know of the 5G OnePlus phone so far, including recent reports of the device likely to be US$300 costlier than the current OnePlus lineup, we are lead to believe that this could be 5G OnePlus after all. Whether this leak was intentional or an employee's mistake is not known but Ishan said that he received it from an anonymous sender. Either way, it should not be too long before we get to see the device in action.